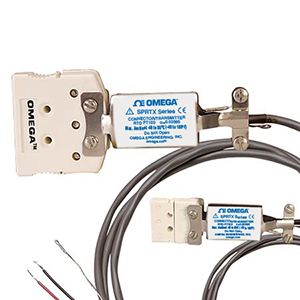 The OMEGATM SPRTX and STCTX Series are high performance, low cost, industrial RTD (Resistive Temperature Device) and Thermocouple Connector-Transmitters. Both feature a encapsulated micro miniature signal conditioner built into a patented connector housing. The SPRTX signal conditioner converts the resistive change of a 100 Ω, 0.00385 RTD sensor or probe across a dedicated temperature range into an industry standard 2-wire, 4 to 20 mA analog output. The STCTX signal conditioner converts the non-linear millivolt output of a thermocouple sensor or ungrounded probe across a dedicated temperature range into an industry standard 2-wire, 4 to 20 mA analog output. This analog output can be sent hundreds of feet away from the location of your sensor (probe) to an indicating device, controller, PLC, computer, data logger or chart recorder. Note: Thermocouple models (STCTX) can only be used with ungrounded probes and sensors. The STCTX/SPRTX Series is not for use in medical or nuclear applications, nor flammable nor explosive environments.